Gelato * is just such an apt name for this colour. It's hand spun and dyed mohair from New Zealand. The label said the equivalent of 12 ply. 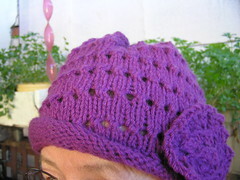 I think I used a 7 mm circular needle. Needles were put away last week, so I'm not too sure of the size used. It's a simple feather and fan pattern. The whole scarf is whisper soft, airy and light. Actually I had trouble photographing it in the breeze up here on the third floor. I tried hanging it from the jacaranda in arm's reach, but the tree was moving too much and the photo was blurred. There is a lot of orange in the scarf and some gorgeously lemon parts as well. It looks just like citrus gelato. 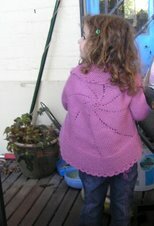 The feather and fan pattern was done on 36 stitches, just two repeats. it's quite a wide scarf and longer than many I have. It's about 2 metres long, although that's not easy to see from the photos.I don't wear scarves much, nor high necked jumpers as they irritate my neck. Not itchy because of the wool, just the fact that something is there. However, this is long enough to wear it a bit loosely around the neck and I'm planning on having it give some zing and zest to a black top I want to wear to a conference on Saturday. I've had the wool a couple of years. It was bought at Tapestry Craft in one of their June sales. I seem to remember that the yarn cost just over $30 before the sales discount. I decided I wanted something bright and amazingly cheerful. It was particularly easy to wind from the hank. My swift is broken and I couldn't find any chairs here at this new place which I could place the hank around. Finally settled on an old, antique, embroidered firescreen which was just the right size. The hank unwound easily without the slightest trace of a tangle. That's just as well, as the mohair certainly stuck to itself. * My Apple computer's spellcheck does not know about gelato. It suggested gelatin, (without the "e" on the end,) as a substitute! LOL.